Every now and then we get the unusual request - here is a pool in green. It turned out really well and suits the location to a \"T\". What happens when 250,000 people walk over the surface in 5 years. Well Epotec withstands the wear and tear very well. It was worn off some of the rough concrete surfaces. The owners were so impressed after 5 years, (they expected 3 years max) that they went with Epotec again. A sand blast to smooth up the previously rough concrete surface, 2 coats of Epotec and back in business for another 5 or more years. From fibreglass pool to great blue pool. A school with a 33 M, condemned fibreglass pool, had the surface sandblasted. Then two coats of Epotec in Mid Blue provides a hard wearing, easy clean, smooth surface, that\'s good everyone back in the swim. When you want to be more imaginative, then Epotec can go the distance with you. Epotec epoxy pool paint. A great colour scheme, for a special location. Epotec goes equally well in your spa. Here is one in Pale Jade, repaired and completed by the owner. Now to relax! The colour of your pool will vary throughout the day and night. It’s a complex situation however in simple terms it’s a combination of the following factors: Pool surface colour: e.g. Bondi, Tasman or Pacific Blue Sky: cloudy or clear Amount of sun light: sunny or dull Angle of sunlight striking pool water: over head or low angle. Water clarity and chemical balance: dissolved solids etc Depth of water: from shallow to deep. Is water surface a mirror or rippled Over hanging greenery: trees or shadows being cast across pool. There are others too that add to the end result, however you may consider your pool and its colour a living thing, reflecting all sorts of inputs. Its quite unlike selecting a colour for the wall of your house…it changes colour much more during any one 24 hour cycle. This is part of the magic of having a pool. The attached picture shows a newly filled pool coated with Epotec Bondi. They were taken less than a one minute apart and show the effects of clouds passing overhead. When you see other pictures in our Project Galley of the same colour but taken at different pools under different conditions you can see how varied are the results…… magic. For example the White Epotec pool shown here taken on bright sunny day goes from almost white at the shallow end (2 ft) to a nice Coral Sea Blue at 10 ft deep. 3 years use & abuse. A big pool and big usage. A Olympic size training and general swimming pool. Still going well after 3 years. 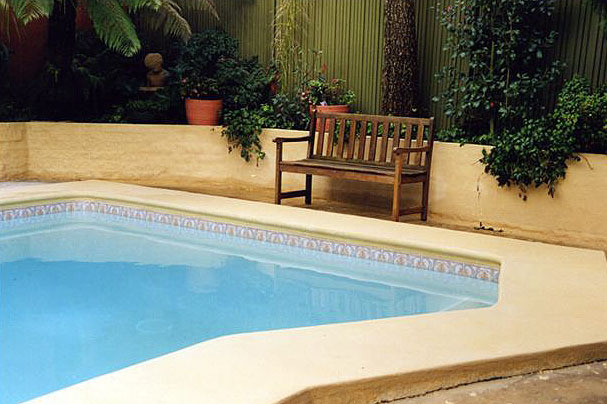 A private pool owner in Dubbo selected Epotec Opal for their Fibreglass pool.